Browse: Home / 2013 / March / Everybody wants to be a cat. Who loves dressing up? I love dressing up! I seem to be going to a lot of costume parties recently which is great because planning and making the outfits is so much fun. I love putting a lot of planning into what I wear. 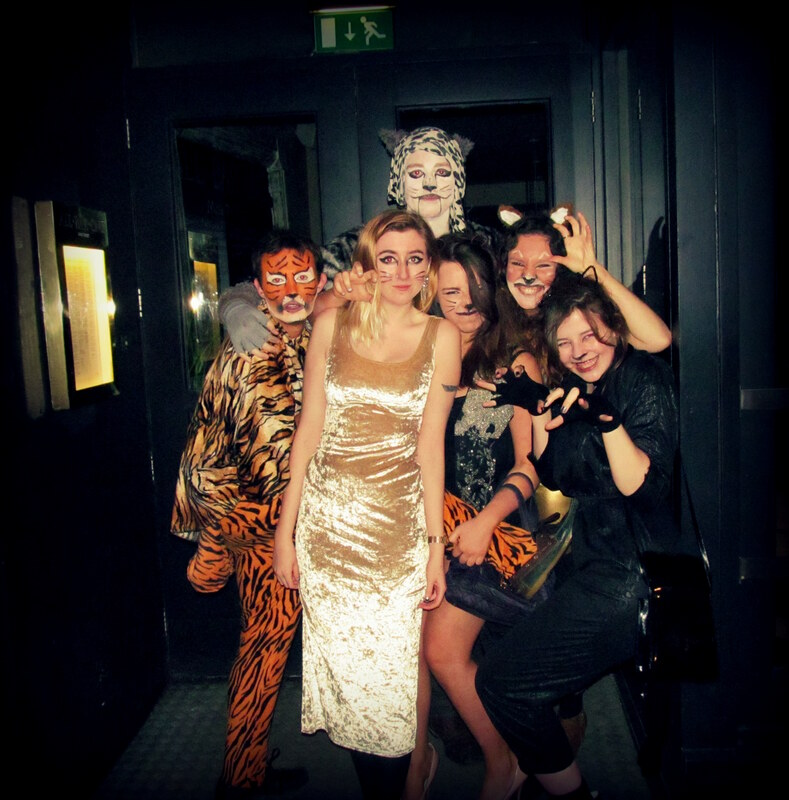 People who go to themed parties in their normal clothes are BORING. 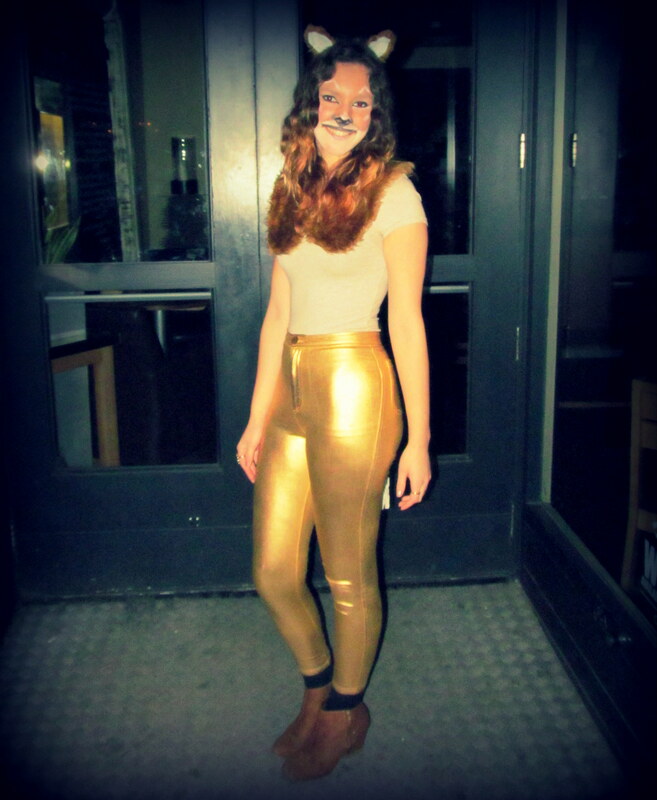 Recently, my friend had a cat party, and I dressed up as a lion. 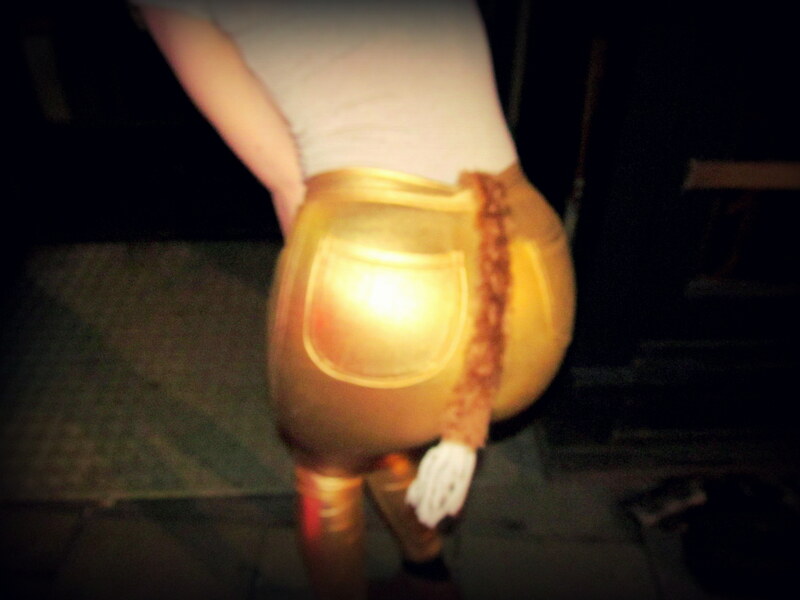 I made a tail – which I attached onto my gold disco pants with a safety pin – some ears, and a fur collar. The great thing about the collar is that it isn’t obviously part of a costume, so you can wear it during the day too! 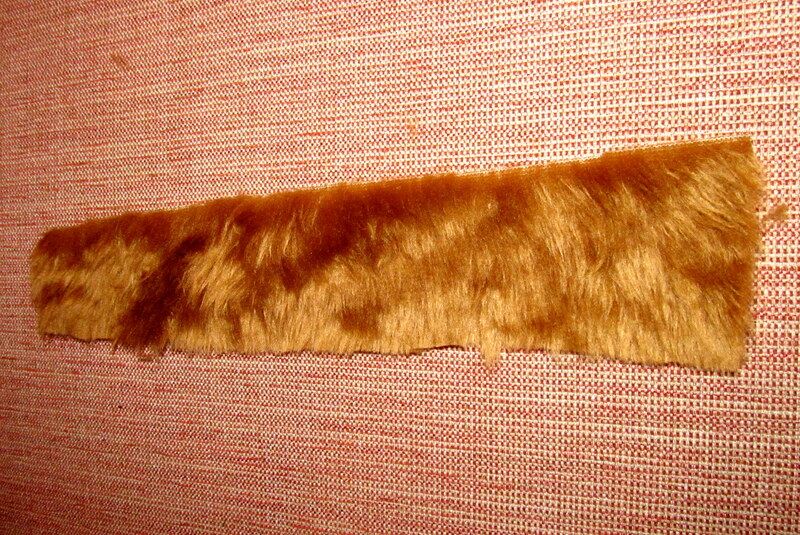 Step One: Cut a strip from your furry fabric, 4cm wide, and 40cm long. Step two: Fold the fabric over, like is shown in the picture below, and sew it together. Step three: Cut a piece of white fabric, 5cm by 10cm. Put PVA all along the bottom of the fabric, and roll it into a tube. When the PVA is dry, cut into the white fabric at the top so that it has tassles. Then, push the white tube into the bottom of the furry tube. When you pin it onto your trousers, it should look like this! 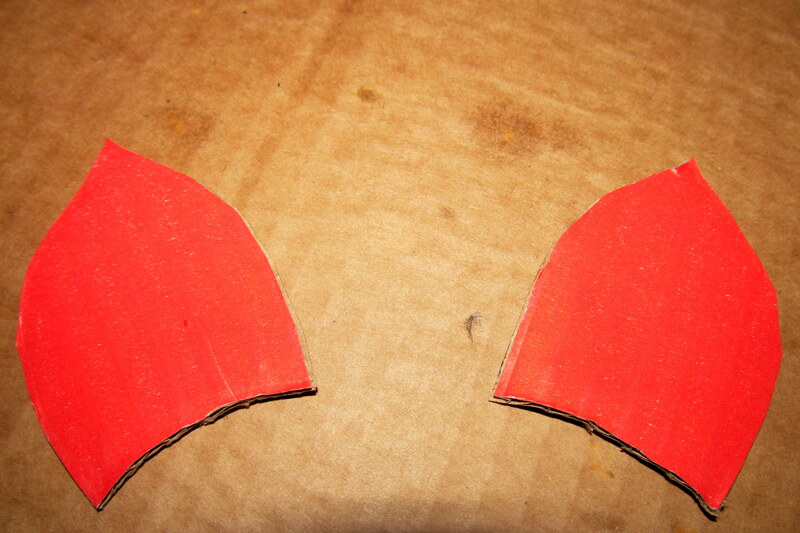 Step 1: Cut out some ear shapes out of the cardboard. 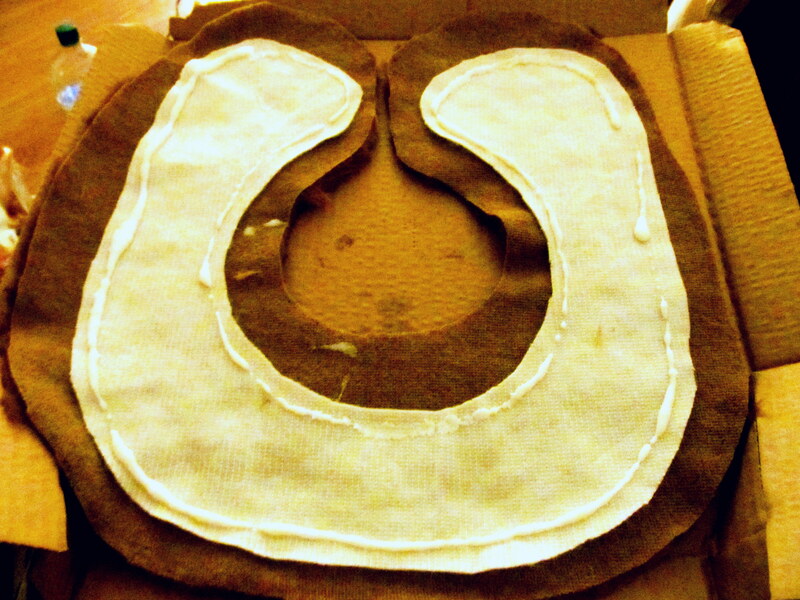 Step 2: Cut out two ear shapes out of the furry fabric, making sure that the shape is at least 2cm wider than the carboard, the whole way around. 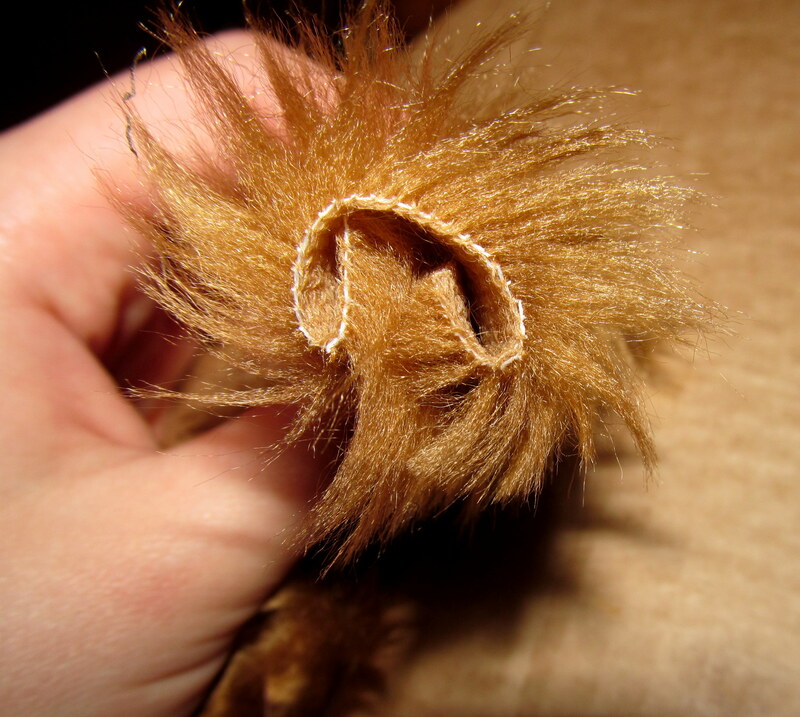 Then, glue the furry fabric onto the cardboard, sticking the excess fabric onto the front of the carboard ears. Step 3: Cut some smaller white fabric ears out, and glue them on, so that they cover the carboard that is showing through. Step 4: Glue the ears onto the headband! This part can be tricky, so I tied the ears to the headband with elastic bands whilst they were drying. Step One: Cut out the collar shape from the white fabric twice. You can see the pictures below for guidance on what the shape should look like! Then cut out the collar shape from the furry fabric, making sure that it is at least 3cm wider all the way around than the white collar shape. Step Two: Put one of the white collar pieces onto the furry fabric and fold the furry fabric over, gluing all around the edges, like shown below. Step Three: When this has dried, glue the second white collar shape down onto the side where the white fabric is showing through. Whoo, and you are finished! Have fun partying with all of your catty friends. Have you made any costumes recently? You officially go to the coolest parties. Grrrrrrrrrrr – you make a lovely lion! Where did you get those gold pants??? looks great!